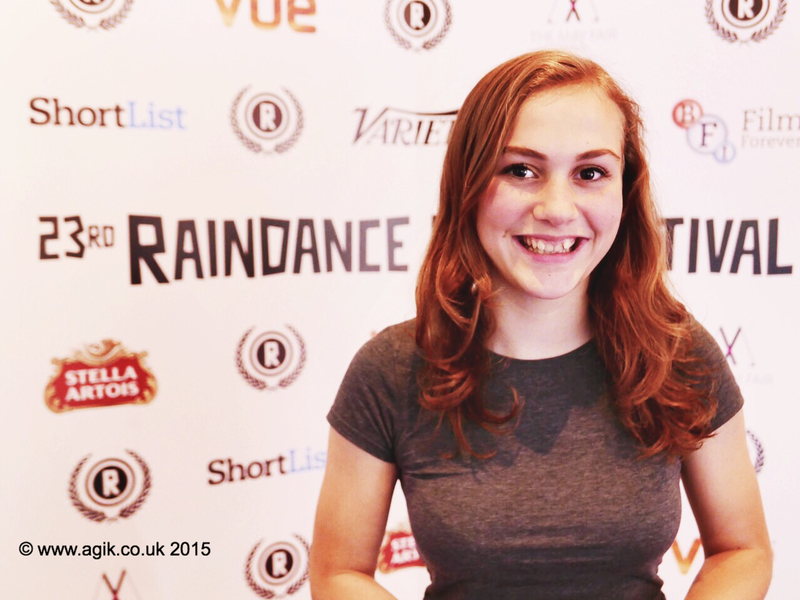 Getting your film screened at Raindance, Europe’s largest independent film festival has got to be a major highlight of any filmmaker’s career. And to experience this aged 13, with my film that I made last year, when I was 12 was a mindblowing amazing experience. My 5 minute short ‘We the Mountain, We the Sea’ was screened on Saturday night on the 3rd October before a feature about Charlie Hebdo. The short was made to accompany and illustrate the most incredible audio track of the same name, taken from the album Corpus Mei, which is a collaborative venture between poet Penny Rimbaud and producer Youth. This was it’s world premiere. There was such a buzz about the Vue Cinema Piccadilly where the festival was held, I got to meet Elliot Grove and the rest of the Raindance team, the foyer was full of talk about everything film. It was exciting, and an experience that I’ll never forget. And lots of fun catching up with actor Jassa Ahluwalia and hearing about his forthcoming acting roles. Here’s some snaps from the Festival! FANTASTIC news! Thanks to Wales On Sunday’s coverage of my film work this year, and their reporting and appeal of the theft of my camera equipment, along with the appeal on ITV, and here ITV NEWS online, a Welsh based video production company, Rockadove got in touch with Wales On Sunday, wanting to help me carry on filming, and they have done just that in the most incredible act of generosity, by donating a video camera to me! Me and my little sister went to meet them in their production studios in Cardiff, to be presented with this amazing new camera. I got to see some of their excellent sleekly produced videos. I’m so happy and full of gratitude to them for this. And hope to do some work work experience with them in the future. They are a great team with a good vibe, truly good people. A really big shoutout to Wales on Sunday for following my film screenings this year, and supporting me by running an appeal when they heard that my film equipment was stolen. They first called me for an interview when they heard about my film being screened at IYAF in July 2015: the start, and then got in touch when they heard about the burglary and now interviewed me about Raindance here. Have you ever wondered what my home education is like? Well, last week I made a Vlog on my YouTube channel as I was asked to contribute to arts award voice’s creative education month, talking about how my education works and answering some questions I am frequently asked. Magdalena is getting harder to film without her noticing, so I’m going to tell you something I would have filmed if I had managed to catch it, when we were in London we were catching lots of different buses and straining to see the numbers as they approached asking each other she turned round and told me ‘I know what the numbers mean, its how old the buses are’ That made me smile, I love her logic. So, now away from the bright lights of Central London to the quiet hills of Wales to declog, order and make space on my computer so that I can get on and edit Episode 9 of My Little Sister (who happens to have Down’s syndrome). After the blow of loosing so much of last year’s footage I’ve had a nice surprise,my Dad has found some footage that had been accidentally copied onto another harddrive. This is SO brilliant as it is from the prime footage that I had wanted to base this year’s episode around! Watch this space as hoping to release it Spring 2016! And if you haven’t seen the other 8 episodes, head over to my shop to view them online or buy the DVDs! Agi K's family's car was broken into. The recordings are irreplaceable but with your help the filming kit can be replaced. Any amount will help!